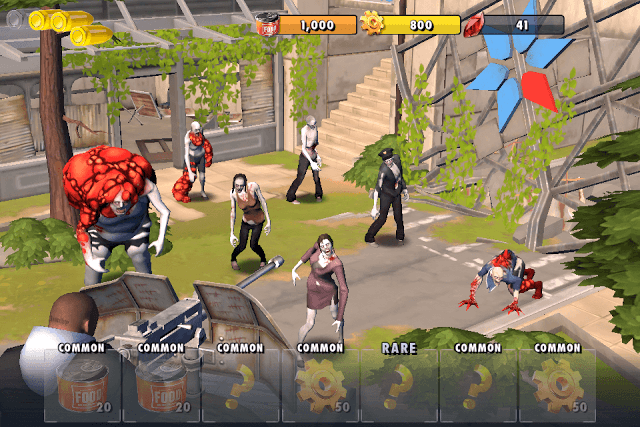 Zombie Anarchy lets you fight the undead CoC style. The Clash of Clans mechanics goes pretty with the zombie theme. You will have to manage a base, set up defenses to protect your HQ, recruit survivors, destroy zombie camps and raid player bases. There’s also a special zombie hunt mini-game that lets you quickly tap on enemies to get rare, common and uncommon rewards. Although fighting zombies in groups can be more effective, you can control each survivor and move him to the desired destination. You can also select a character to target a specific building/mercenary/zombie. Just tap on a survivor’s icon located at the bottom-left corner of the battle screen and then tap on an area or enemy you want to target. While battling zombies, your squad will always choose a target that is closest to them. 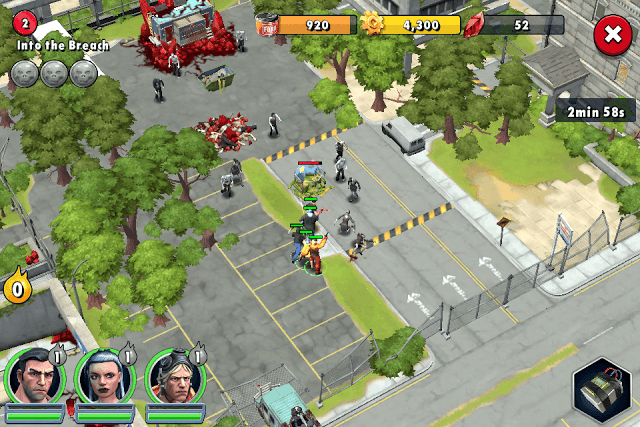 Things can become dangerous if your team is targeted by a watchtower (or maybe a fast-paced zombie) from a distance while they are busy attacking a building. 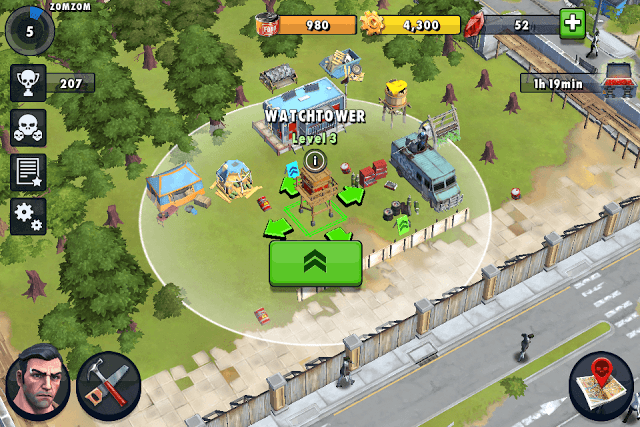 In such situations, you can just tap the watchtower to order your entire squad to target it or select a few survivors by tapping their icons and then tap the watchtower. The above phrase not only applies to the undead but also to your squad, at least in Zombie Anarchy. Deploying more survivors on Z-zone will increase your chances of destroying smaller buildings and zombies faster. Also don’t forget to use survivor abilities that benefit the entire squad. Examples: Igor’s HAZMAT suit and Nathalie’s Hair Trigger ability can be very crucial in your battle against the undead. The HAZMAT suit provides your team with armor and the Hair Trigger ability will increase your squad’s movement and attack speed considerably assisting your team to destroy/kill buildings/zombies faster. Every time you destroy smaller structures, you reduce your enemy’s headquarters HP to some extent. Your rivals will also try their best to target smaller buildings first, which will make it easy for them to tear down your weakened HQ. So don’t just focus on your headquarters, protect smaller buildings like Shelter, Cannery, Food Storage, Salvage Storage, Recycler etc. You can place watchtowers and other defensive buildings in such a way that their range (white circle) covers small buildings, including your HQ. Tap defensive buildings like the van or a watchtower to check their range and if they don’t cover most of the buildings, then just press and drag them to an appropriate area. You can also place explosives close to smaller buildings to give a tough time to intruders. In the previous tip, I recommended placing watchtowers and other defensive structures in such a way that most buildings fall within their range. Upgrading watchtowers and other defensive buildings not only increases their Damage and Health, but also boosts their range. 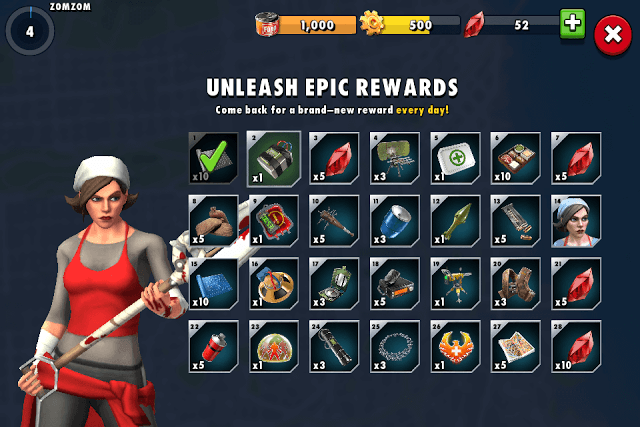 To upgrade them you will need salvage (golden gear icon) and special materials, which can be earned by attacking zombie camps or by raiding rival players camp. The Van plays a key role in defending your building. It has a gunner mounted on top of it. The gunner shoots anyone who comes within the van’s range. You should upgrade your van if you want to increase its Health, get XP, and increase Damage and most importantly if you want to take extra devices with you to battle. Now these devices can assist you in destroying zombie camps faster. There are several devices such as satchel charges, RPGs, sentry guns, shock blast, adrenaline cloud etc. Now that you have upgraded your van and unlocked an additional device slot, you might be confused as to which device you should take to battle. Some are rare and should not be taken for easy battles. You should take the best devices for hard-to-defeat zombie camps. You can also choose the best ones in case you are raiding a higher-level player or a tough event. 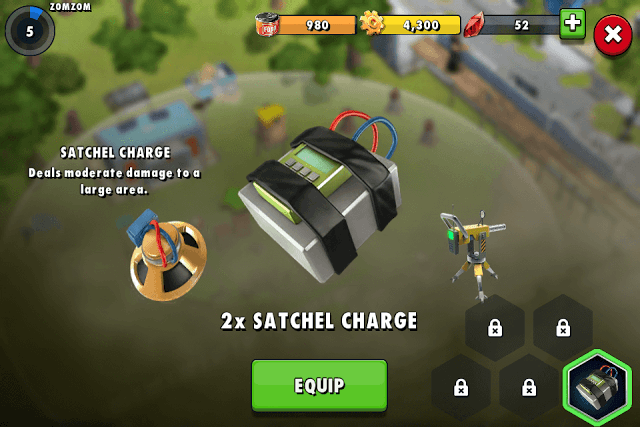 Satchel Charge– Can be thrown anywhere and blow up tough targets. Sentry Gun– Just drop it in an area infested by zombies and it will eliminate them one by one automatically. Adrenaline Cloud- Slows down time while increasing your team members’ move and attack speed. Can be very effective against buildings and zombies. Hunter’s Fury- Lowers the focus cost of abilities for a limited period of time. Your survivors earn focus when they destroy a building and with this device used, you will get more abilities. You can choose any one of them if only one slot is unlocked, or select the best device(s) if more than one slot is unlocked. Besides getting a random device from the Zombie Hunt mini-game mode, you can also get a device from daily rewards. Check the chart to see at what day you can receive a device. You can play the Zombie Hunt mini-game when you have collected all 3 golden skulls, and this can be achieved by destroying everything at the undead camp/rival player base. Once you have recruited a good number of survivors, start playing those levels that are shown with a black pin on the world map. You can win such missions easily, get 3 golden skulls and play the mini-game to get a chance to earn some more devices. All devices are stored in your Van. Tap your van and press the spanner icon to check what type of devices you currently have. You will also find a special “Zombie Hunt” pin on the battle map. This will let you play the mini-game directly, without requiring winning the battle. Accessing this mini-game mode will allow you to win more super rare and rare rewards, including devices. But you will need at least 20 bloodstones to play the game. Complete achievements. The “Achievements” section can be found by tapping the three skulls icon to the left side of the screen. Note the tasks and complete them to get bloodstones. Complete Daily Bounties quests. Tap the “Events” pin on the world map to find Daily Bounties. The Daily Rewards section also has bloodstones. You will get them if you log in on day 7, 21, 28. On day 14 you will get a free survivor. You can earn XP by constructing new structures, upgrading existing structures and completing quests. The XP you earn fills your player level meter located at the upper-left corner of the screen. Leveling up unlocks new stuff, so keep upgrading buildings and constructing new structures to get XP. In zombie camp levels, you may find explosives scattered here and there. The undead will charge at your squad so make sure you position your survivors in such a way that the explosives fall between your squad and zombies. Here, the “Lure” device can be very useful to attract the undead. You can throw the blood pack at the explosives area and if there are any zombies nearby, they will move towards it and Boom!